Saturday night, the Cuyahoga Astronomical Association (CAA) held their first Public Star Party for 2015. The event took place at the club’s observatory situated on the grounds of the Medina County Park System’s Letha House Park in Spencer, Ohio. As a member I was in attendance with my massive Meade 6-inch refractor, one of many members there to share telescopic views with public visitors. Attendance was light, though folks were generally enthusiastic excitedly moving between telescopes. The sky was beautifully clear and allowed high-quality views of the Moon, Jupiter, Saturn, Venus, the Hercules Star Cluster (M13), and other amazing things. Things quieted down early and after a while, visitors disappeared. I’d brought my DSLR camera hoping to try some through-the-telescope astrophotography. 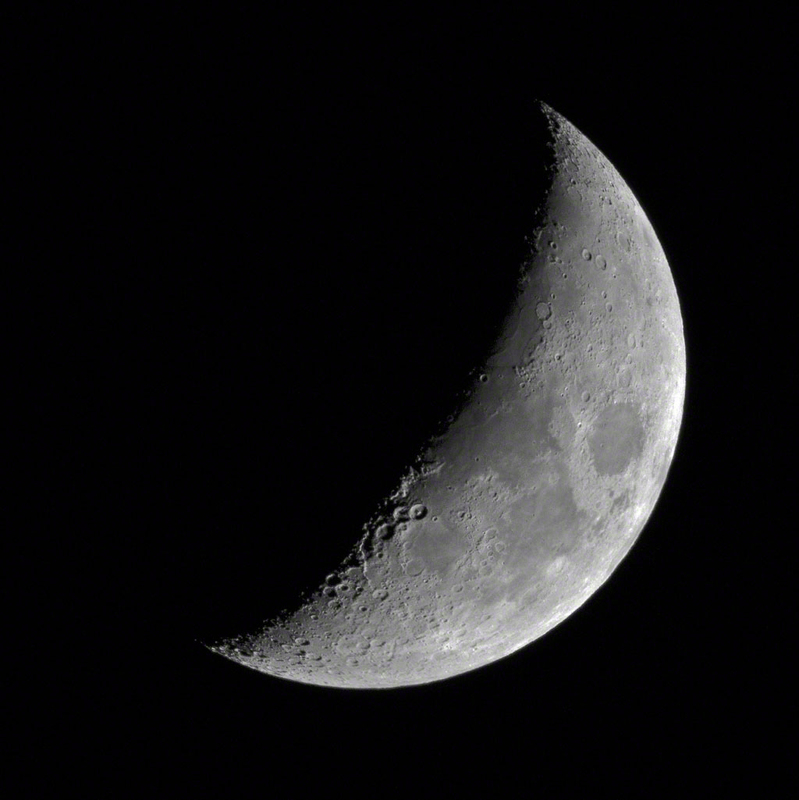 As other club members began packing their gear, I attached my camera, focussed on the Moon, and began a quick photo run of several interesting objects. I shot the Moon, M13, M4, Jupiter + moons, M57 – the Ring Nebula, and M81/M82 – aka Bode’s Nebulae. The Moon shot and M13 (above) were pretty good considering how little time I was able to spend on them. The Bode Galaxies (as they are sometimes now known) were literally a shot in the dark; I couldn’t see them in the camera viewfinder due to their faintness so I let the telescope system aim and I triggered a couple of brief exposures. Even at that, when excessively brightened, the digital image begins to show the spiral pattern of M81 extending far beyond the bright core seen below. 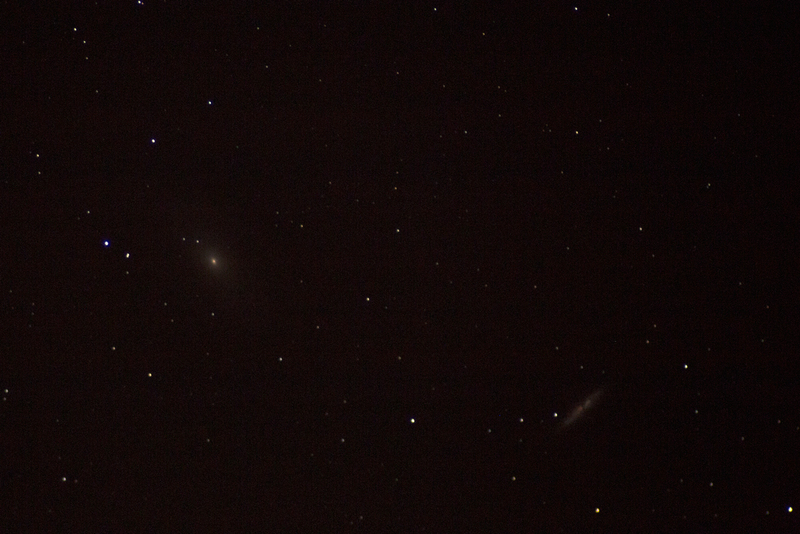 The elongated, split appearance of M82 is also quite visible in my blitz-image. Seeing the galaxy pair in the same telescopic field of view is one of my fond memories of visually exploring the sky; seeing it mimicked in one of my photographs is pretty cool. To end my night at Letha House Park, I took flashlight in hand and, with camera now mounted to a tripod and camera lens installed, hiked down to the edge of the park’s lake. 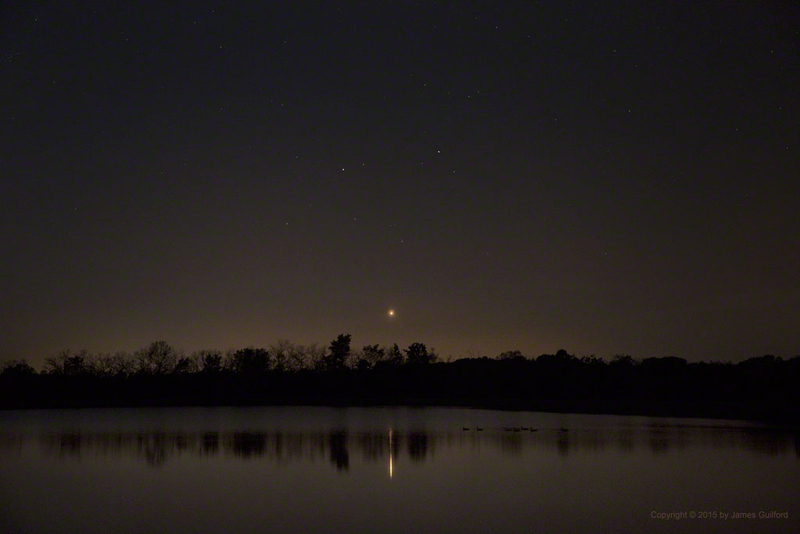 Reflected in the still waters was brilliant Venus, close to the horizon, about to set; the stars of Gemini floating above the Goddess of Beauty. I made several hurried exposures of the lake scene and returned to my telescope. Looking at the camera’s preview window, I had some idea of how well things were going but I’d have to wait til I got home to see the real results. I arrived home at 1:00 AM and moved my gear into the house, then downloaded the camera’s image files to my desktop computer. I was delighted with what I saw. The telescope had located each of the several objects without my needing to look through the viewfinder — some were too dim to see there — and tracked those objects well enough to prevent most movement during the several seconds of each exposure. 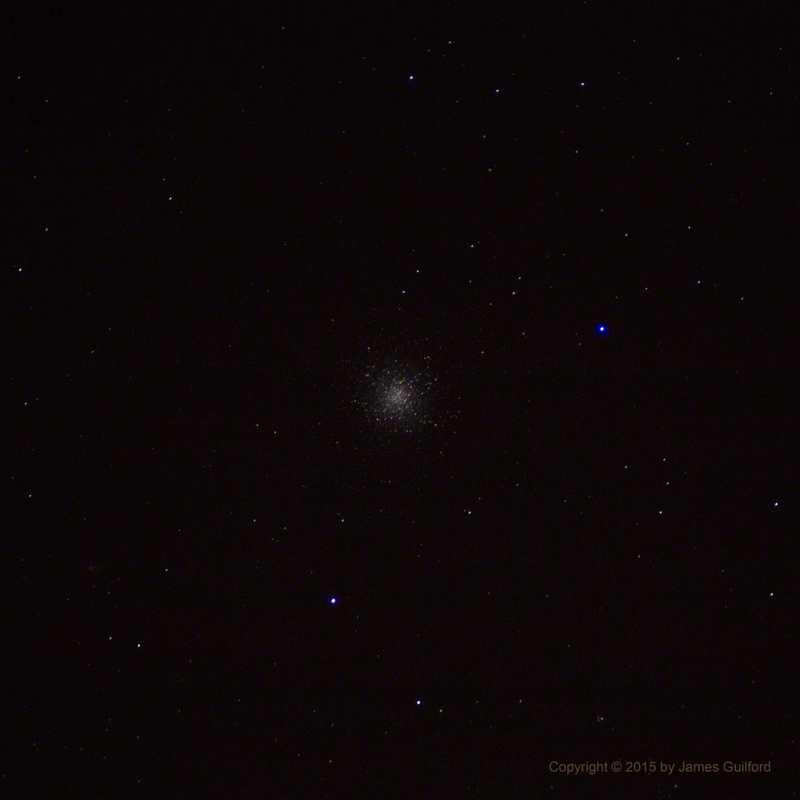 There, on the screen, was a beautiful gathering of stars — the M13 star cluster — and the best deep sky image I’d ever made. The dim and distant Ring Nebula (M57) also registered, even displaying some color. A bit less impressive was my image of the M4 star cluster in Scorpius, though it registered well enough to be readily identified. By today’s amateur astronomy standards, mine are primitive beginner’s efforts. Still, I’m pretty happy and very excited with what I got during my photographic blitz session as promising indication of what is to come as I continue to image the sky. Photo Notes: The camera was attached to the telescope, in essence, using the telescope as a 1,200mm telephoto lens; this is called the “prime focus” approach. The large, bright star cluster M13 in constellation Hercules is made up of about 300,000 stars and is located 22,000 light-years away. Venus, seen through the telescope, is noticeably not a “circle” but in a partially-lit phase. It was so brilliant that it was difficult to observe through telescopes. The Moon was in waxing Gibbous phase, 5.9 days old, and 396,748 km (246,528 miles) distant.